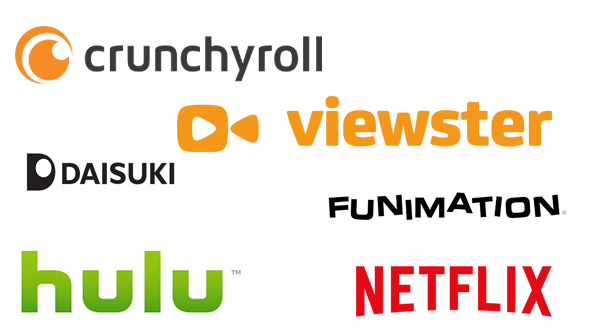 Home / anime / blog / CP / streaming / The Anime Streaming Arms Race: Good or Bad News for Fans? The Anime Streaming Arms Race: Good or Bad News for Fans? Anime fans have never had it so good. We now live in a time when the vast majority of the latest anime (and many hours of back catalogue) are available online, legally and in English. Most new shows are available within hours of their original broadcast. Recently though there has been much more competition in the market. Some pretty big names have been getting in on the action and as a result, the whole streaming sphere is getting more competitive. But is this a good or bad thing for the fans themselves? The major development is giants such as Netflix and Amazon getting in on the game. Netflix has been acquiring anime for its catalogue for some time, but more recently it has been stepping up its game and picking up exclusive rights and even getting involved in making their first anime. Amazon meanwhile is just getting into the simulcast world for the first time. For anybody who already subscribes to these services, them moving into anime more is a nice bonus. They offer excellent streaming platforms, and in the case of Netflix at least (it's too early to say with Amazon) have been treating anime well, with multiple language options and subtitle tracks. Meanwhile, anime-focussed streaming sites such as Crunchyroll and Funimation Now are also having to fight back. You can expect more and more deals like the recent Crunchyroll/Kadokawa deal in future, as the sites will more aggressively chase exclusives and other ways to make them stand out from the competition. Perhaps a bigger issue though is that of global availability. Netflix is now available in almost every country on Earth, but Amazon Prime video only serves a very limited number of countries. Want to watch Kabaneri Of The Iron Fortress outside of those countries? You're out of luck.. for now at least. It's been the case for while that sites such as Crunchyroll have offered a smaller selection of the shows outside the US, but they seem to be seeking worldwide (outside Asia) rights more often. With this development and Funimation's expansion outside of the US this year, things are improving on this front at least. So is this streaming 'arms race' good news or bad news for fans? Would it be convenient if every anime could be watched on one service, with just one subscription? Of course, it would, but when has media ever been like that? You could never watch all the shows you wanted on a single TV service either, or buy all the games on a single console. That's how competition works. Ultimately if companies like Amazon and Netflix are getting into it, it suggests the industry is in pretty good health, and that these companies see value in anime. These firms have a huge amount of money to splash about, so if they're pumping money into the industry that's no bad thing. We don't know if these companies will ultimately decide that it's something they want to be in on in the long term, or if this will be a flash in the pan. But one thing is for sure... it's got the potential to shake up the anime industry like never before.